Disney's Animal Kingdom is, of course, the newest park in Walt Disney World. But there is still a lot of concepts that nearly made it to the park and off the drawing board but didn't. One such attraction was the Excavator. What is that you ask? 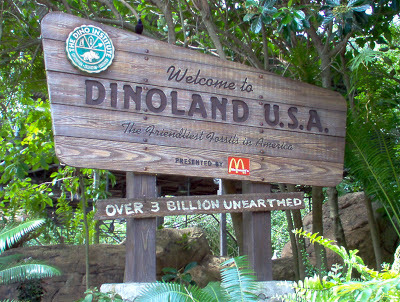 Well, it was supposed to be a major headliner in Dinoland. It was a wooden coaster that was to take place in a fossil dig site. The conceit was never fully developed. I mean, why on earth would there be a giant wooden coaster in a dig site? From the drawings I have seen, it does not seem as if the attraction was built on the bones of the fossils. There simply seems to be a wooden coaster smack dab in the middle of a dig. The concept art does perhaps demonstrate the idea that the guest was in an out of control ore car that would not only pass skeletons but also some of Chester and Hester's roadside "attractions." It also shows the ride vehicle zipping through dino bones as well as a steel mishmosh sculpture that was apparently part of Chester and Hester's plot of land. The coaster was built near the Boneyard. 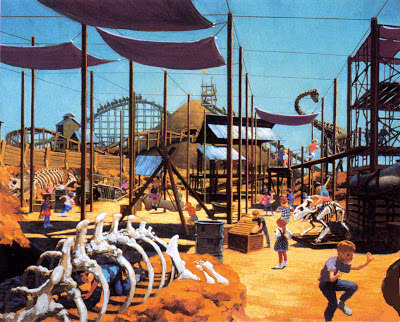 And, in fact, some of the concept art shows the coaster in the background of the Boneyard itself. It appears that Chester and Hester's Dinoland is about where this was originally intended and, thus, was its eventual replacement. For all the backlash the area currently gets, its actually an amazing example of back story and theming. Some day I will layout the back story for you, but needless to say Primeval Whirl, Triceratops Spin and the carnival games are a testament to story telling. Chester and Hester and the old gas station are rich in details. This coaster, it does not seem, would have had quite the same richness in detail if that was built instead. But it would have likely been entertaining and a big draw. So why wasn't it built? The most referenced reason is money. The Animal Kingdom simply ran out of it. Its certainly what cost us the Beastlie Kingdomme. And it probably effected this, as well. Countdown to Extinction was cheaper since it was basically Disneyland's Indiana Jones ride and its always quicker and cheaper to clone. But perhaps imagineers just didn't like it that much. The theming and ride seem a little disjointed. The current set up has the Dino Institute and the neighboring Dinoland, which fit together seamlessly and really let the imagineers tell a story. This attraction, from the details we have, seemed more about thrills than theme. And lets not forget, if they did build this, they probably never would have built a second train coaster, aka Expedition Everest. So it's probably a good thing this got cut, no?